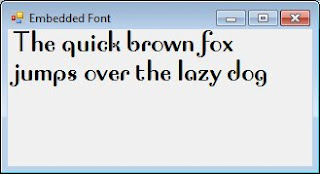 How to load and use custom font, embedded in assembly resources. We leared how to load font not installed in system. But what about embedding font into assembly resources? We will use PrivateFontCollection as in previous example private font loading. But we'll need little bit more action. First we add font file into project. Place it in root folder of project. Go to property and choose action Embedded Resource for font file. Next add code to read font from resource. Unfortunately it will not work instead loaded font from file. Reason is specific of memory loaded fonts, described in remarks to AddMemoryFont method. To use the memory font, text on a control must be rendered with GDI+. Use the SetCompatibleTextRenderingDefault method, passing true, to set GDI+ rendering on the application, or on individual controls by setting the control's UseCompatibleTextRendering property to true. But it can affect other controls in programm. As example some controls fonts can look ugly. So better specify GDI+ rendering only for choosen controls.